Kimono and obi, which can be used for a long time, will get so dirty and worn that you can’t wear them. Even if you inherit a lot of kimonos, sometimes you don’t know what to do with them because your lifestyle has changed. 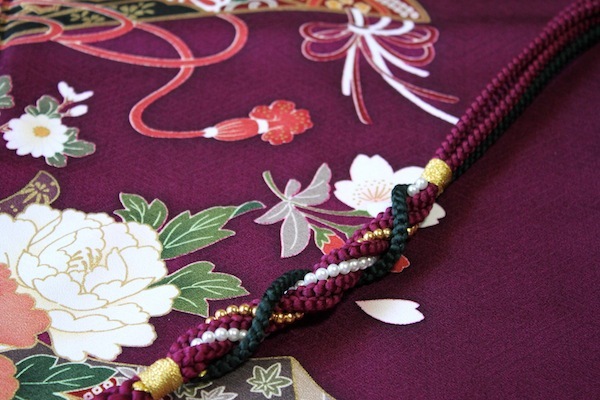 Beautiful kimono which is too small to wear can be used as interior articles. It is easy to use as a tapestry with a bar in its sleeves. In the case you don’t know where to decorate with it or it is not worth decorating, you can use it as a remake material. Many people may hesitate to cut a kimono. However, people in the old days remade old kimonos again and again until the end. It may be good for a kimono to be remade into a modern article and be cherished, instead of being put away. A kimono in a good condition can be remade into a dress. If it has a lot of worn areas, you can cut out the unworn area to use for a patchwork. If the unworn area is quite large, it can be used for a bag, a pouch and a cushion.